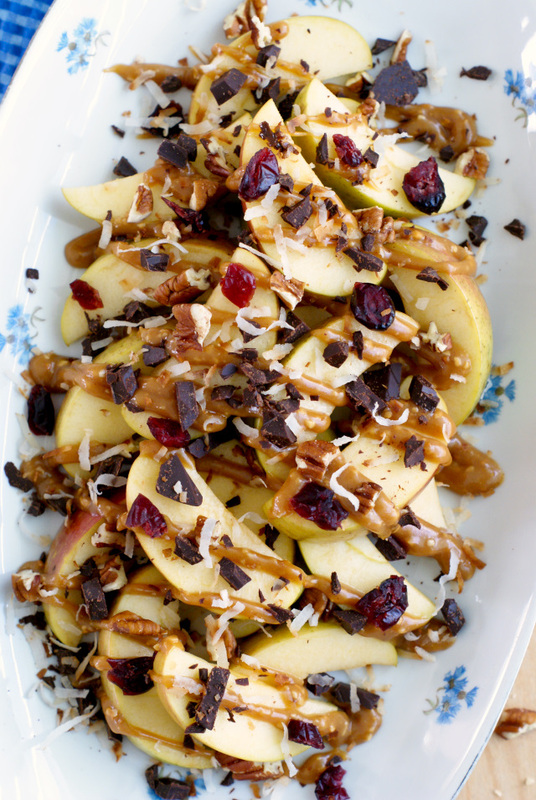 For a healthy fall-inspired snack, make Apple Nachos that are drizzled with a maple peanut butter sauce and topped with dried cranberries, toasted coconut, chopped nuts, and Lindt Chocolate! Almost daily, my kids are asking me for something sweet to eat. Sometimes it's when my daughter gets home from school and sometimes it's after dinner when they start begging for dessert. Who am I kidding? They ask what's for dessert as soon as we sit down to the dinner table. They love their sweets. Because I'm a good mom who is concerned about her kids' health (and her future pediatric dentist bills), I'll usually limit uber sugary sweets (like the plate of Brownie Cupcakes with Fudge Frosting that is currently sitting on my kitchen counter) to every once in a while. Moderation is key and all that jazz. Luckily, I can make something like these delish Apple Nachos for my family and it completely satisfies their cravings for sweets in a much more healthful fashion. These nachos have it all. Apples and cranberries remind me so much of fall, which inspired this combination of ingredients. The crisp apples are the perfect base for all kinds of toppings. In addition to the cranberries, I used chopped nuts and toasted coconut. Coconut isn't really fall food, it actually reminds me more of summer. When it's toasted though, it gets all nutty and golden and I just can't resist it. So I added it. Feel free to omit if you're seasonally selective when it comes to recipes. Ha! And then there's the always fabulous Lindt Chocolate chopped up and sprinkled over everything. 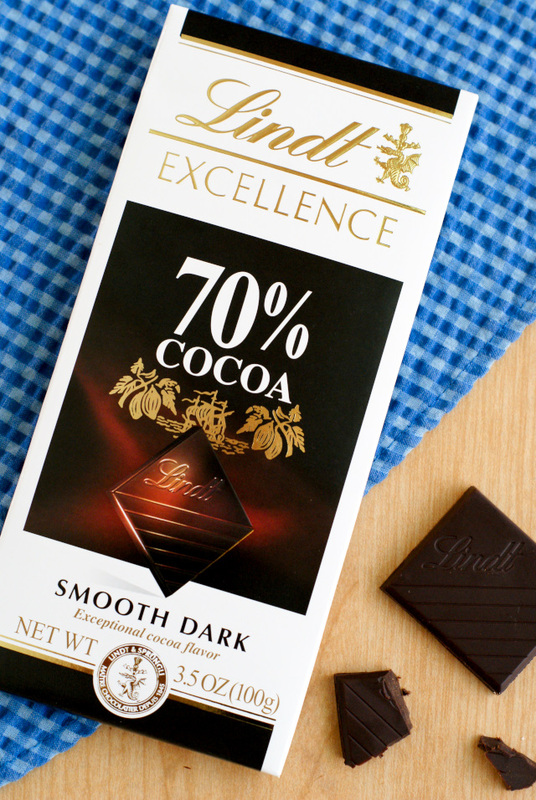 I used a Lindt 70% Cocoa EXCELLENCE Bar which is seriously one of my very favorites when it comes to chocolate. 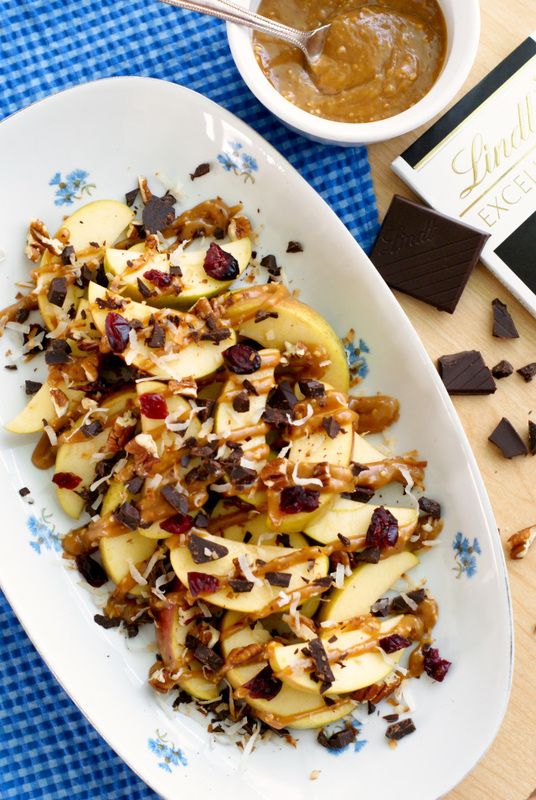 The luscious and smooth dark chocolate paired perfectly with the sweet apples and maple peanut butter sauce. All of the flavors come together perfectly and, surprisingly, two cut up apples are enough to satisfy up to four people. I was surprised that there was enough to go around for our family of four, but all of the toppings make it a heartier snack than just a simple apple by itself. The best thing about this recipe (Well, second best because the Lindt really takes the cake here! ), is that you can make them in a snap. All you need to do is a little chopping and a quick melting on the stovetop and all of this deliciousness can be yours! My six year-old daughter was super impressed with how fancy they seemed and I played along even though it took less than ten minutes to throw together! You could serve these as a simple after school snack like I did, but they are special enough to be a fabulous addition to a brunch party spread. Finger food is always good for a party! I just love that wholesome, clean ingredients can come together so easily and make such a beautiful plate. I know you'll love these as much as we did. Spread sliced apples out onto a serving plate. In a small saucepan, heat the peanut butter and maple syrup over medium heat until completely melted, stirring frequently. 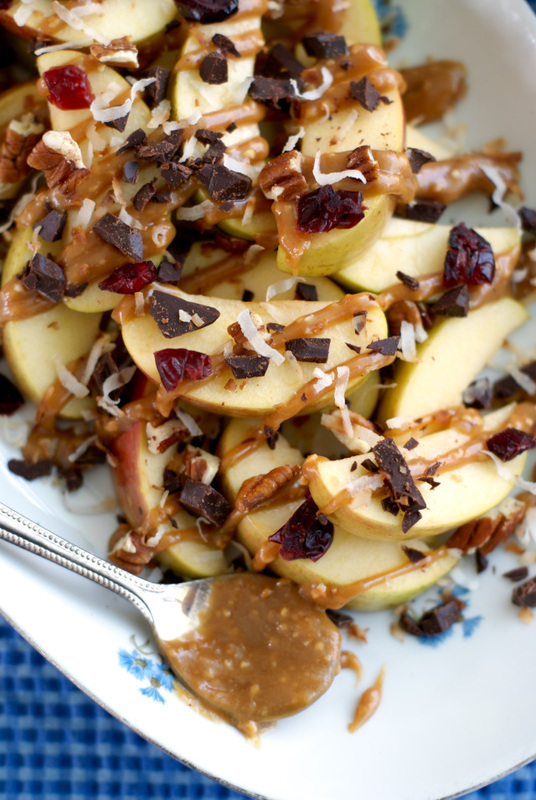 Drizzle the peanut butter mixture over the apples and top with the chopped Lindt Chocolate, cranberries, coconut, and nuts. I used chunky peanut butter because it's what we like and always have on hand. You can use any nut butter you like. If you have any extra peanut butter sauce, you can use it as a simple apple dip! This post is sponsored by Lindt Chocolate as a part of #Choctoberfest with Imperial Sugar. All thoughts and opinion are, as always, 100% my own. 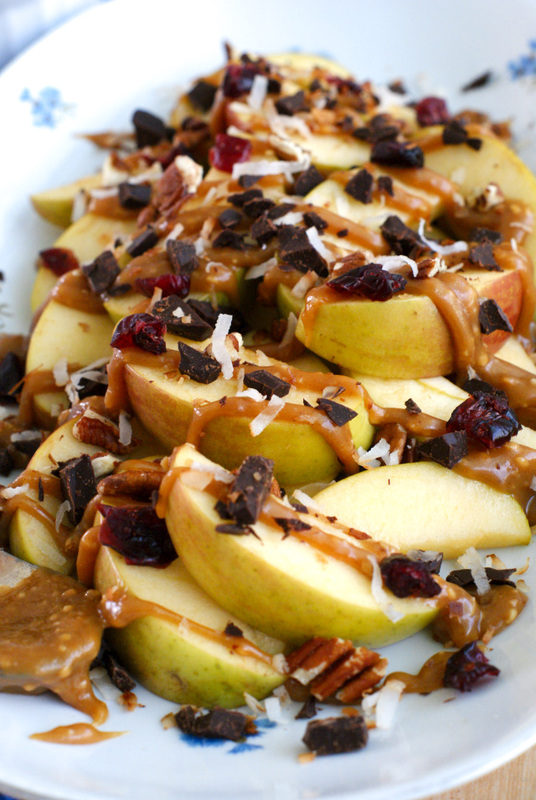 I love these apple nachos. I love the flavors. I love the name. And I love the presentation. What a fun treat! And gorgeous, too!